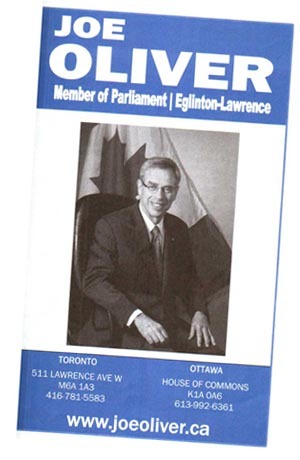 Taking my MP – Joe Oliver – Up on His Offer! I was thrilled and delighted to read in Linda Nguyen’s article on Canada.com (and in Jennifer Pagliaro’s article in the Toronto Star) that you are open to speaking with environmental groups. I want to take you up on your offer as I am both an environmentalist and one of your constituents! I am writing to request the opportunity to meet with you in Toronto concerning research for my new book which will have a story on Canada’s Energy Future and the Northern Gateway Pipeline. Specifically I want to help the “average Canadian” (including my neighbours in Eglinton-Lawrence) to understand the issues at play, and what’s at stake from an economic and environmental perspective. 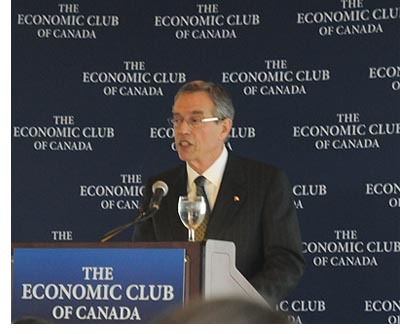 Last Friday, I paid $79.00, plus HST, to attend your speech “Moving Forward With Canada’s Energy Future” at the Economic Club of Canada in Toronto. However your talk didn’t answer my questions, and unfortunately you didn’t have a Q&A session afterwards. Hence, the urgent need to meet with you in person. I would very much appreciate the opportunity to discuss the pro’s and con’s with you at your earliest availability. I was educated entirely in Canada, receiving degrees from both Mount Allison and the University of Victoria. I am a taxpayer — as a Canadian citizen, a residential property-owner, and a small business-owner. I am an independent author. My illustrated book, Bothered By My Green Conscience, was published in 2009 by New Society Publishers. I am not funded by any group outside of Canada — or inside Canada for that matter! Although I have created international projects (which have won awards), I have worked my whole life in Canada. I have worked on projects for the Ontario Government as a Vendor-of-Record, and done communications work for some of the largest and best-known brands in Canada. In 2003, I organized and led a Trade Mission to Los Angeles for the OMDC (Ontario Media Development Corporation). In 2011, I created a story for the Forest Stewardship Council of Canada called “Who cares about the Forest?” In researching that story I went to the Boreal Forest and met with the four stakeholders: the logging companies, the First Nations, the community groups and the environmentalists. I was really struck by FSC’s model for sustainably managing the forests. The four groups must reach consensus on all decisions. FSC is a Canadian and international success story. I wonder if FSC’s model of decision-making is one that you would consider adopting in developing the oil sands, and in bringing the oil to market? I look forward to hearing from your office as soon as possible and scheduling a face-to-face meeting. Let us know how the meeting goes. The minister spoke at the unveiling of a federal plaque to Professor McLuhan at St. Mike’s last year. I noted at the time that his mere presence seem to change the singing of “O, Canada” into a tory attack ad! Now my impression may have arisen because I was one of the few protestants in attendance. However, the minister’s sang-froid is a key memory of the event. Again, let us know the results of your valiant mission to represent your own perspective to your duly elected member. You da woman, Franke! Superb letter. I hope you get your face-to-face. Franke please let me know how this goes. This is what America is missing. We need more Americans like Franke to stand up for what they believe in. You have my support ! Hope you hear from him soon and that he agrees to a meeting. Love your letter! Thanks for your work. Great letter and hope you get your meeting.